War is not glamorous. World War I was a miserable ordeal that cost of many lives. That’s the message that is most apparent during Valiant Hearts: The Great War’s heartfelt journey. On the surface, Valiant Hearts appears to be a cartoonish affair, but in actuality it’s one of the more poignant depictions of WWI era warfare. 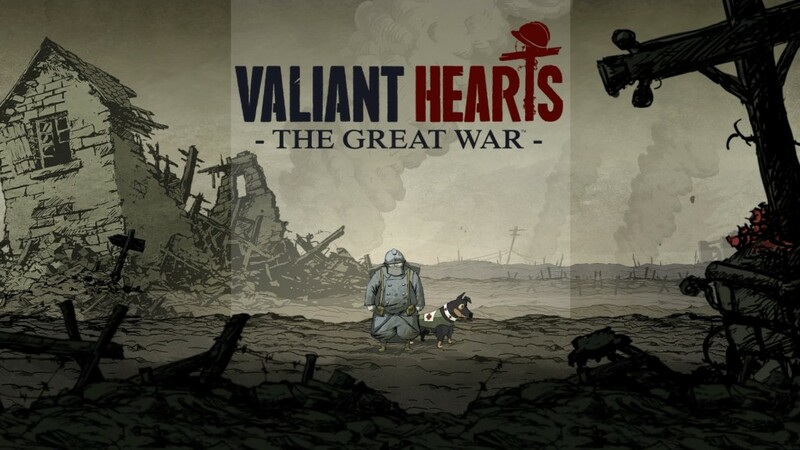 Valiant Hearts takes place during The Great War aka, WWI, and follows the entangled journey of four characters of various nationalities: Freddie, Emile, his son-in-law Karl, and Anna the nurse, with their trusty dog, Walt. Driven by their own motivations, each character has a story to tell; some more tragic than others such as Freddie, the American now living in France, seeks revenge over the death of his wife during an initial artillery strike. While the basic outlines can be interpreted, the lack of written or spoken dialogue during gameplay hinders character development. Excluding cutscenes all of the characters’ backstories are told through diary entries unlocked at the start of each level. While a creative means to build character, there aren’t enough diary entries to reach its potential. That being said, there are moments that are quite moving, particularly a strong ending with one of the best sequences in the game. 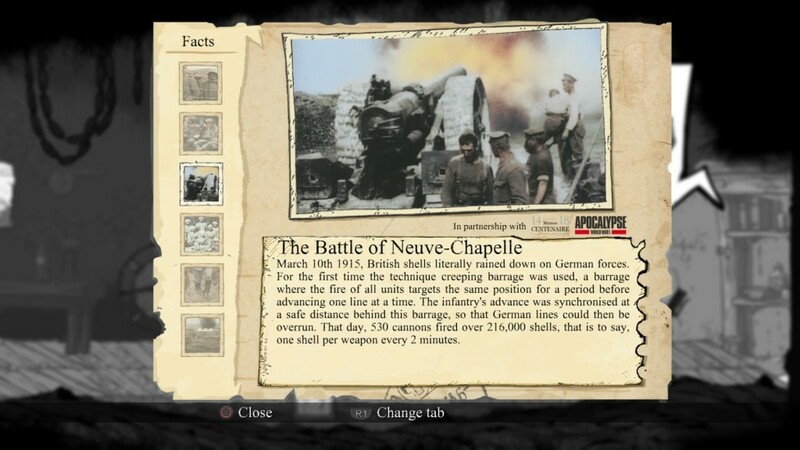 One of my favorite features of the game is the inclusion of historical facts attached with colorized, vintage photography of relevant WWI imagery. These facts help set the scene of each level and tone of the entire game, informing the player on the locale and the general quality of living both soldiers and civilians of that time experienced. Additionally, over 100 collectibles are scattered throughout the game, and every collectible has a snippet of historical information attached. I found many of these facts so interesting; that I wanted to replay the 6 to 8 hour campaign to find the collectibles I missed just to unlock more tidbits. 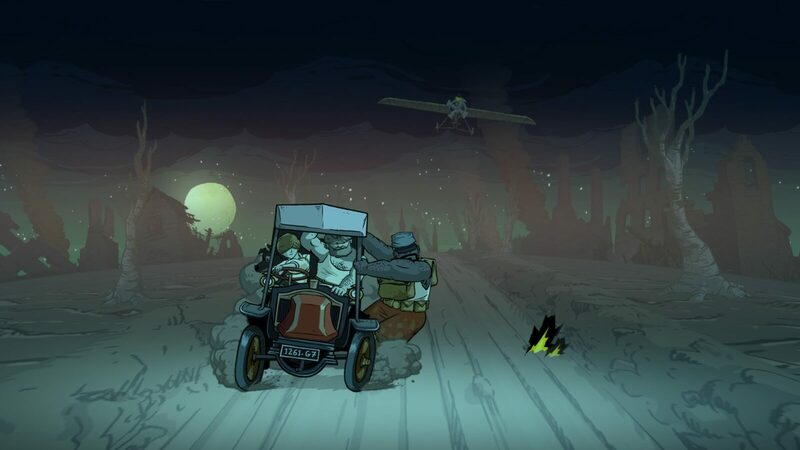 At first glance Valiant Hearts appears to be a lighthearted adventure, but that couldn’t be further from the truth. The casualties of war and the hostile, intolerable conditions takes it’s toll on all characters as they ask themselves, “What is the point of all of this?” When the game begins in the very early stages of WWI, rich color tones decorate the scenery, but by the end of the game, characters such as the Frenchmen, Emile are literally climbing piles of dead bodies. Sections of the game take place from both the Allied and Central powers’ perespective, so there was never a totally bad side in the game, with exception to the big antagonist, Baron Von Dorf. Focus instead shifts to the personal struggles of war and the desire to reunite with family. Primarily a puzzle solving Side Scroller through the use of item retrieval, trading, and lever pulling, Valiant Hearts has a very basic control scheme. The simplistic gameplay and functionality isn’t particularly exciting, but sometimes the game makes the most out of its limitations with some really cool segments. Several levels of the game consists of the players simply dodging incoming artillery fire in a car, while being chased down by other vehicles, yet it is all perfectly synchronized to Johannes Brahms’ Hungarian Dance No. 5, and it’s amazing. Another level focuses on one character escaping a POW camp into a field in total blackness. As he’s being pursued by guards, a flare is fired in the background, lighting up the entire screen, a visual cue to urgently hide behind cover. Sections like these make it difficult to want the game presented any other way because gameplay/story integration wouldn’t work nearly as well. The lack of interaction due to simplified gameplay can be a frustration. Direction on what needed to be done was sometimes unclear with little explanation given. During one boss fight with a tank, I failed so many times that I finally caved and used the in-game hint feature. Most of the game was easy to interpret, but every so often I had no idea if I was doing something the wrong way. Despite some of the intense combat scenarios these characters experience, there really is no in game penalty for death. When killed in the game you pick up not far from the point of death. This isn’t necessarily a bad thing; you can jump right back into the action with no hassle, but dying serves absolutely no purpose otherwise. While the aesthetic style isn’t a workhorse like a typical AAA title, it’s sometimes just as visually pleasing. After hours of dark, muddy, and miserable color schemes, sections with vibrant colors serve as satisfying refreshments. The layered background and foreground littered with animations create the illusion of an active 3D environment. A beautiful, classically scored soundtrack consisting of compositions both familiar and unknown. Emotional moments sound moving, and action-packed scenes feel epic. The game could have benefited with more dialogue either textual or vocal. In a market saturated with first-person shooters, it’s refreshing to see a war game take place outside of the familiar. Many games on the market glorify war in all of it’s visceral action, but Valiant Hearts: The Great War is a cruel reminder of the unpleasant reality of warfare. WWI isn’t a topic that is widely depicted in media or even in school (or at least when I was in school). 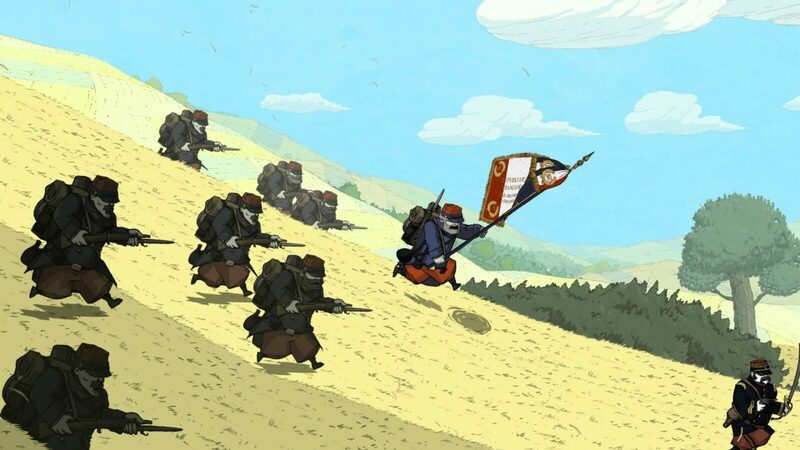 Oddly enough, Valiant Hearts is one of the most engrossing depictions of WWI that I have ever experienced. On the surface, Valiant Hearts appears to be a cartoonish affair, but in actuality it’s one of the more poignant depictions of WWI era warfare.